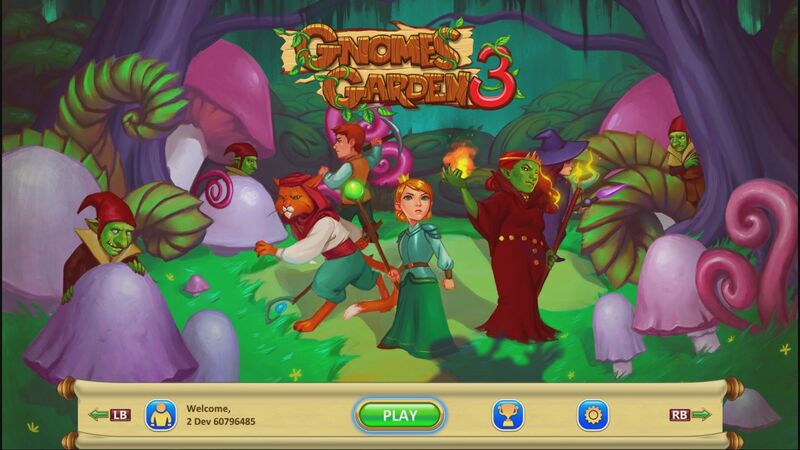 When I first heard about Gnomes Garden 3, my first thought was “Oh no, I’ve not played Gnomes Garden 1 & 2, will I be able to pick up the storyline?”. Luckily, it turns out that things are relatively straightforward. See, Gnomes Garden 3 runs with a basic tale which kicks on when the Gnome Princess finally comes home, fresh from her summit with the Troll Queen. The talks went well, and she arrived back with the Queen’s friendship and a peace agreement. Sadly however, all was not well, as an evil Warlock Collector has only gone and stolen the Gnome Monarch’s castle, along with the rest of the royal family. Obviously, there’s only one Gnome for the job, but she must gather a team if she hopes to defeat the Warlock and restore both the family… and the castle. 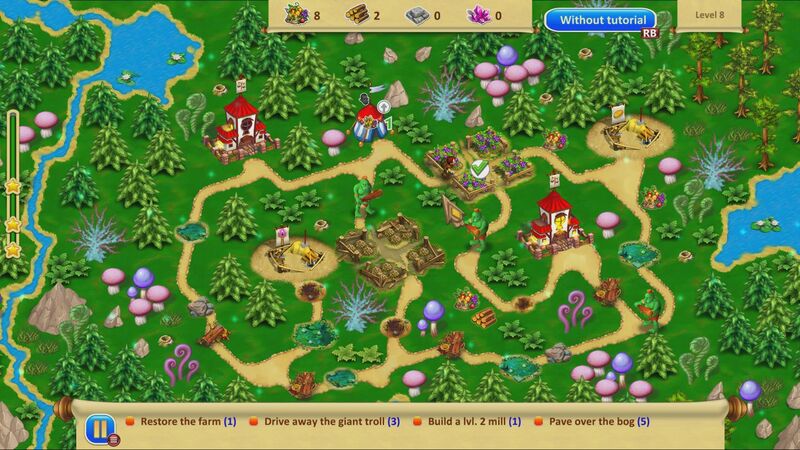 Gnomes Garden 3: The Thief of Castles belongs to the genre of games known as “Time Management”, where you have to set your minions tasks to achieve – to do this they need a certain amount of resources, whether that be food or stone. You will have seen these games all over Facebook: the map screen is a mass of nodes, and success in one level opens up the next, with each rated out of three stars as to how well you did. Well, this appears to an almost straight port of one of those games, although thankfully without the microtransactions that plague this genre. To use a cliche, the gameplay is one that is easy to pick up but hard to master. Luckily, the first few levels are treated as tutorials, easing you into the mechanics as you control a gnome, who will do your bidding. He can gather resources, like food that may be lying around, and also dismantle roadblocks, which can provide you with wood and stone; two things which are used to mend things like quarries, bridges and so on. Each task you ask the gnome to perform has a cost – chopping up a roadblock will need a certain amount of food, restoring a bridge will need food and wood. You get the idea. You can also upgrade structures, so a sawmill will give four lumps of wood instead of two, or if you upgrade the gnome tent, you can command two gnomes at once. This does cost twice the resources, but certain structures can only be mended by ensuring two gnomes are working together, so it’s worth doing, if you can afford it. This is where the management element comes in: you need to prioritise the correct things, otherwise you will run out of resources and be forced to restart the level. If you have to fill in a pit, for instance (something which needs a lot of stone), it’s always worth making sure that the quarry is operational first, as this will give a source of stone and allow you to complete the level. Do the pit first and you won’t have enough stone to fulfil the rest of the tasks, which are helpfully listed at the bottom of the screen. Other things you’ll need to restore include Fireman’s Houses, Witches’ Houses and Mines, each of which gives you extra abilities. Witches can plant trees and the fireman can water the ground surounding it to ensure that they grow… assuming that you’ve mended the well and got water, of course. Firemen can also scare off thieving Goblins, who wander in and help themselves to your resources. Mines produce magic crystals, which the Witch needs to plant her trees, as well as to scare off Giant Trolls who block the path, but the food cost for these Witches is quite high, so having a mill or farm that produces food is vital. It is a very well designed system, to be honest, with each of the classes of helpers feeding back into the others. The secret to success on any level is seeing everyone work together. The scoring of the levels is based on time, but that just means that getting three stars is quite a challenge, and will require perfect management of your little helpers. To help with the management there are various magic powers that become available to you. The first allows your helpers to move around the map at an increased pace; ideal when on a resource collecting run, letting you gather more in the same period of time. The second you unlock allows the gnomes to work faster, cutting down the amount of time it takes to mend a house or chop a roadblock down. Most useful of all though is the ‘stop time’ command, especially if a goblin is about to run off with the wood you desperately need! These powers take time to recharge, so using them at the correct time is vital. Each level can be retried as many times as you like though, and with an achievement for 3-starring all the levels, it’s worth trying your best to get them right. Graphically and it has to be said that Gnomes Garden 3 isn’t going to set the world on fire, but it’s cute and colourful, and that’s really all it needs to be. The game involves no violence at all (even the goblins are dispatched by the fireman tooting his trumpet at them), and so is ideal for all ages. The sound is ok too, with the helpers all shouting “Hey” when you ask them to do something, and the fireman’s horn blast being very nice in particular. The story is advanced with a series of static cutscenes and dialogue bubbles, and this is adequate to let you know exactly what is going on. With four different areas of the map to unlock, and with over 40 levels, the game doesn’t suffer from a lack of content, although I am sceptical that anyone can make it last 20 hours as the developers suggest. The main problem we have though is that this is a game that has been hit with a massive sense of sameness; within 10 levels you’ve seen everything that it has to offer. There’s only so many times that you can mend a bridge before it all becomes a bit deja vu, after all. The controls are a bit niggly as well, and it is hugely obviously that this was designed for use with a mouse as the stick control method is just a little imprecise. This is particularly noticeable when the odd treasure chests appear, leaving you to chase them around the screen, mashing the A button as you hit one. I don’t think I’ve succeeded in catching one yet, as the controls aren’t up to the task. 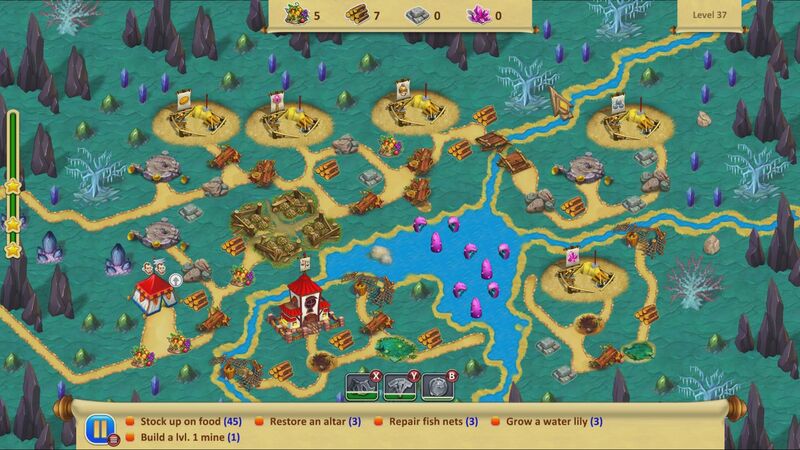 All in all, Gnomes Garden 3: The Thief of Castles isn’t a bad game. There are a lot of levels to beat, and even if they do get a little repetitive, there is still a small draw to seeing what the next stage brings. It’s a nice, cute game let down only by a dodgy control method and a general feeling of deja vu. If you are a fan of the genre, then this a good example to play, but otherwise I think it will struggle to convert players to its cause.